Biography of Italian Sculptor, Exponent of High Baroque Classicism. One of the greatest Baroque sculptors, and the only one to rival Bernini (1598-1680), the Italian artist Alessandro Algardi was the main exponent of the style known as high baroque classicism. This was a style mid-way between the dramatic naturalism of Bernini and the restrained classicism of the Flemish artist Francois Duquesnoy (1594-1643), and was the forerunner of many monuments in Italy, France and Flanders. Active mainly in Rome, Algardi is best known for three major works of Baroque sculpture: the Tomb of Pope Leo XI (1634-44), the colossal relief-sculpture of Pope Leo Driving Attila from Rome (1646-53) - both in St Peter's Basilica in Rome - and the sculptural group of The Decapitation of St Paul (1641-47) in S Paolo, Bologna. Also famous for his portrait busts, he is considered to be one of the finest ever portrait sculptors and a master of marble sculpture. Algardi was born in Bologna, and trained first at the Academy of the Progessives (Accademia degli Incaminati), the centre of the Bolognese school pioneered by Annibale Carracci the fresco painter, which emphasized drawing from life and bold draughtsmanship. His interest in sculpture, however, led him to become a pupil and assistant to Giulio Cesare Conventi (15771640). Algardi must have shown an unusual talent, because when he was only 20 years old his work attracted the attention of Duke Ferdinand I of Mantua, who gave him a number of commissions. During this period Algardi worked principally in stucco and terracotta, as Bologna had very little local stone. In addition, he became skilled in small-scale works, and was employed by several goldsmiths and jewellers to create models in gold, silver, and ivory. Algardi's breakthrough came in 1634, when Cardinal Ubaldini (Medici) was appointed to build a funeral monument for Pope Leo XI (1555-1605) who had been Pontiff for less than a month, back in 1605. Algardi received the commission for the tomb, and used a design similar to the one used by Bernini for the Tomb of Urban VIII (1627-8): the pope is seated, his hand slightly raised in blessing, while two female figures stand on either side of his raised throne. However, Algardi's marble composition is less active than Bernini's which is more dynamic and dramatic. 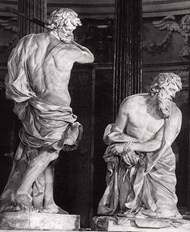 Even so, the fact that Algardi was given the honour of creating a papal tomb shows the esteem in which he was held, and in fact his sculpture is of great importance in the development of Baroque art because it is the first major sculpture to try and reconcile the naturalism of Bernini with a more classical idiom. And although the full and animated folds of the drapery reveals an obvious debt to Bernini, Algardi has deliberately not exploited the dramatic possibilities of the tomb. In any event, despite its relative feebleness, the work had an even greater influence than Bernini's papal tombs. 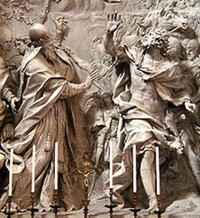 While he was engaged on Leo XI's funeral monument, Algardi executed a second major commission - his statue of The Ecstasy of Saint Philip Neri with kneeling angels (1638, Santa Maria in Vallicella, Rome). (Please compare Bernini's dramatic Ecstasy of Saint Teresa, 1647-52.) Shortly after, he completed a similar group, for the church of the Barnabite Fathers in Bologna - The Decapitation of St Paul (1641-47). This featured the kneeling saint, resigned to his fate, and the executioner ready to strike the fatal blow. These three works of Christian art established Algardi's reputation in Rome. Although typically Baroque in the vigour and transparency of the attitudes and poses of their figures, his works benefit from a certain classical heroicism, and effectively made him the leader of the Roman opposition to Bernini - a role further reinforced by his election (1640) as head of the Fine Arts Academy of St Luke, in Rome. In order to appreciate important 3-D artists like the Italian sculptor Alessandro Algardi, see: How to Appreciate Sculpture. For later works, please see: How to Appreciate Modern Sculpture. Algardi's situation improved further upon the accession of Innocent X - of the Bolognese house of Panfili - to the papacy in 1644. The additional commissions which this brought him included the following. First, the design of the Villa Doria Panfili (1645-48) outside the San Pancrazio gate in Rome. This project was a joint effort between Algardi and the architect Girolamo Rainaldi, with Algardi and his assistants producing a range of sculptural works for the interiors, the exterior facade, as well as the fountains, statues and other garden features. Second, a bronze portrait bust of Innocent X (1650, Galleria Doria-Pamphili, Rome). Third, the huge marble Fuga d'Attila relief for St Peter's, showing Pope Leo XI restraining Attila from marching on Rome (1646-53). This work, at the time, the largest high relief sculpture in the world, involved the carving of two three-metre high figures representing Leo XI and Attila. Other commissions included a range of orders from Spain, notably for the palace of Aranjuez (fountain of Neptune), and the Augustine monastery at Salamanca (funeral tomb of Count de Monterey and his wife); the church facade of Sant' Ignazio di Loyola in Campo Marzio, Rome; and numerous bronze and porphory portrait busts, which were especially popular with his patrons. Unfortunately, Algardi grew so fat in his final years that carving became almost impossible, leading him to rely more and more upon his assistants. He died in Rome not long after finishing his famous Leo and Attila sculpture. In terms of style, Algardi was closer to Francois Duquesnoy (1597-1643) than Bernini. And though technically and creatively unable to match the latter's expressive realism, he tempered its extravagance with a form of classical sobriety, and employed a meticulous attention to detail, especially of costume and drapery. These qualities are evident above all in his portraiture, and groups of children: his terracotta models being highly prized by collectors of the time. But his monumental relief sculptures and statues also set the standard for many future monuments. His pupils included Ercole Ferrata (1610-86), Domenico Guidi (1625-1701), and Antonio Raggi (1624-86), along with others like Girolamo Lucenti, Francesco Barrata and Giuseppe Peroni.